September 7, 2012: My Type-A is freaking out. A while back, I was asked to head up this collaboration project. Cool. Awesome. It's a great chance to work with others, and make someone we all know, smile. I knew that it would be fun, and assumed it would be easy. Instead I am freaking out because I feel completely out of control. This bears no reflection on my co-collaborators, they are doing their respective parts. I am sure that they are doing excellent work. The problem is me. It is my own psychotic mind descending into a free-fall because it doesn't have absolute control over every tiny little aspect that goes along with this project. I am trying to respect the boundaries of the tasks that have been assigned to others, going through them to get the information I'm after instead of going directly to the source as is my nature. It is SO HARD. September 9: There's been a very slight amendment to the plan. Initially Heather-Rose was going to supply the parchment for this piece to be produced on, I have it in hand and everything. A nice, good-sized piece of what she tells me is goat parchment from Pergamena. However, this is a collaboration product for eLeri, who is a very dear friend to many Concordians. When Baron Jean Paul Ducasse learned of this project he immediately offered some parchment, which I accepted. 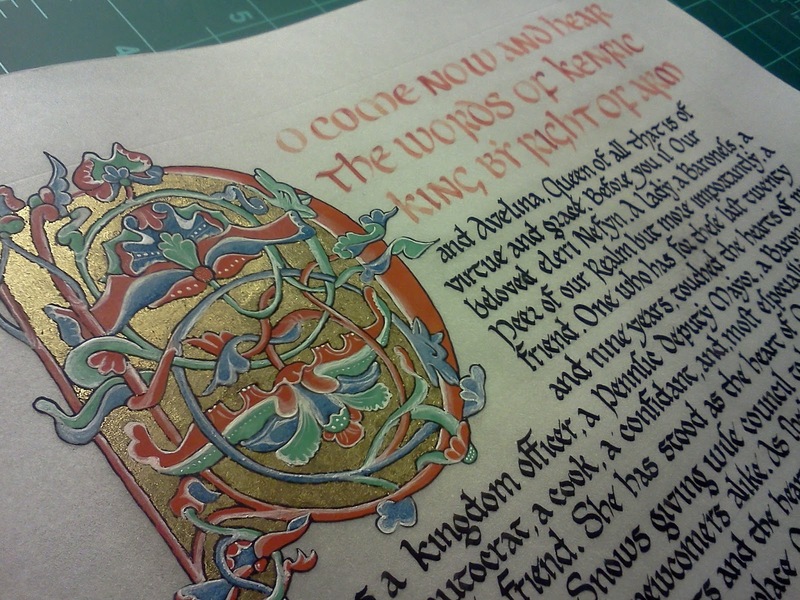 JP's parchment has been cut into pieces, and I've selected a piece for this work. Since he prepares his skins on both sides using period techniques, I am able to work on the flesh-side which offers the "whiter" surface. The surface was prepared by using pumice powder to scour the surface to remove any grease, and then dusted with gum sandarac which will help produce crisp ink lines. The pencil lines for the decorated initial have been drawn in and they will be inked over later in the week. September 12, 2012: Tonight I inked over the pencil lines for the decorated initial. Other than a small mishap early on due to a tiny hair on the nib, the ink went on wonderfully. The lines beaded up and sat on the surface as I was hoping giving me crisp, albeit a little wobbly, lines. I did use a magnifying glass to enhance the precision of my nib on the surface. September 29, 2012: We have a problem. While Elisabeth was doing the calligraphy the ink bled in a way that I have never seen before, it's almost like it was cheap absorbent paper. I'm at a loss as to what to do about it, I really need to think for a few days. In the off-chance that this is salvageable, I've gone ahead and gilded the initial using garlic and 23k gold leaf. October 1, 2012: I'm really unhappy with the quality of this piece right now, so much so that I think it's going to have to be started again from scratch. I really don't see a way that this can be salvaged as the calligraphy just looks really "fuzzy". I'm now REALLY concerned about having it completed in time. I've spent a couple of days trying to think about why this may have happened. The skin is goat produced by JP and finished on both sides, although he's still refining his production techniques I really don't think its the problem for this dilemma. I've used other cuts from this same skin and not had this issue. Even the inking of the decorated initial on this exact piece didn't present as problematic. The surface was pounced with pumice to remove any grease and give a little tooth. 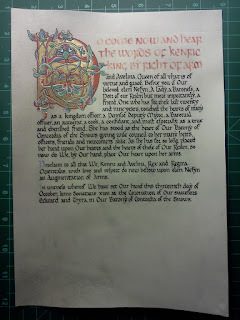 Usually I would follow this up with a second pounce in the calligraphy area with gum sandarac to fill the minuscule crevices and help achieve crisp lines, however because I wasn't scheduled to do the calligraphy I cannot remember if I completed this step. I asked the calligrapher if she had prepared the area in any way and she said no. This could potentially be part of the problem. My instincts are screaming at me that the ink is the main culprit. Not all ink is created equal, and viscosity differs between brands. I exclusively use an iron-gall ink which I purchased through a vendor at an event a couple of years ago, it is fabulous to apply to any surface and I've never experienced an issue with it's application. It has a beautiful fluid consistency which is not to thick and far from thin. I have tried other brands of ink and I am always disappointed with them, either they're too thin (granted, I could use some gum arabic solution to thicken them) or they're very grey in tone. Inks that others swear by, I have a really difficult time with. The calligrapher tells me that she used a Sheaffer brand ink which is her brand of preference, she's never had an issue with it and even her "slopy-copy" on regular paper turned out okay. Not to mention the fact that we all know how fabulous her work usually is. Having now done some very brief searching on Sheaffer inks I've learned that it's considered a very "thin" ink, which supports my hypothesis that because the viscosity is different from my preferred ink it bled along the hairs (capillary action) instead of the viscosity keeping it where it was applied. I've asked the calligrapher if she would be willing to give me some of her ink so that I can test my hypothesis, see whether the addition of gum sandarac to the surface and maybe thickening the ink with gum arabic would change how it feeds onto the parchment. However that's a research project for ink experimentation. In the very near future this piece will be started over from scratch, there's just absolutely no way that this unfortunate mess can be considered "good enough". October 6, 2012: While I sat listening to "Bardic Radio" at the local Concordia event Winter Nights, I was able to get the layout redone and inked. No bleed. 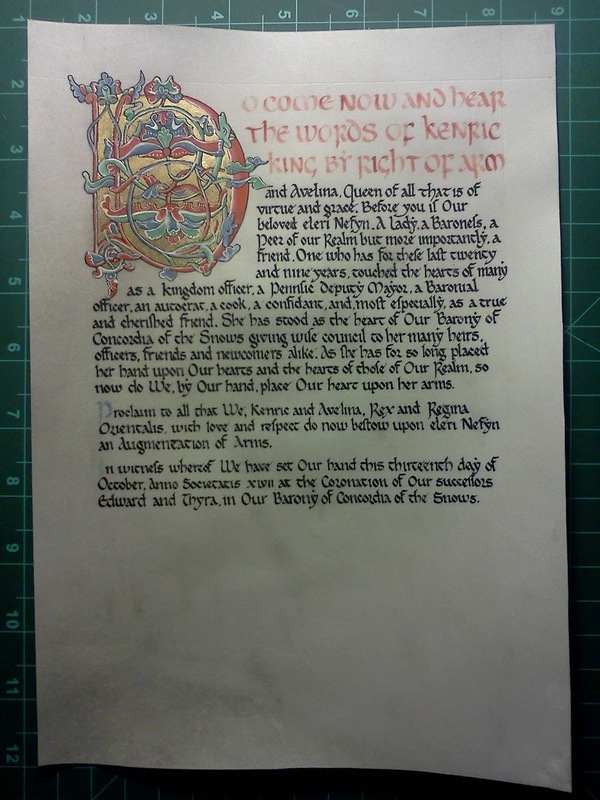 In the quiet of my scribal room, I was able to complete the calligraphy using not only the iron-gall ink that I know from experience won't bleed, but also a red mixed from Cinnibar pigment for the opening three lines. 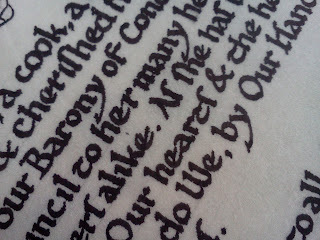 I did misjudge slightly on the length of line three and will need to add an "s" without it throwing off the border. I also mixed up some Malachite and Azurite to use as larger capitals further down the page. I'm not completely happy with the opacity of the red letting, I feel that this needs further experimentation. (As a side note, I need to play with the grinding of both Malachite and Azurite because I'm not happy with them right now, they seem to gritty and I think I could make them more opaque. I need to get some more experience with them). I also laid down the mordant for the gilding. On the original piece I used regular garlic juice, however when I applied the gold-leaf it was even more sensitive to hydroscopic changes than I have worked with before, which I attribute to the ground (parchment instead of paper or pergamenata). This time around I have used a galic / glair mixture which I'm hoping will help with the sensitivity issues for a better finished application. I found that for this mixture I needed to add in some Armenian Bole for colour which not only helps me see where I've applied it but will also bolster the gold. October 8, 2012: Applied the gold leaf which didn't take as long as I thought it would. Small observation, use a little less glair in the mixture next time. I still need to work on improving the crispness of my edges. I managed to also get some of the base colour applied, specifically the azurite and some cinnibar. I haven't used azurite pigment before but Cennini says not to grind it to much as it will turn ashy in colour. However I don't think that I mulled it enough, I think I could have gone a little longer with it. I'll experiment at another time. October 9, 2012: I finished applying the base colours. The cinnibar continued to go on smoothly and the malachite went on better than I thought it would. As a side note, although I have used pigments that would have been available I think that in hindsight I should have used an earth green as the malachite is very "bright" compared to the original. Also, I think that I should have added a fourth pigment in the form of a purple-red to more closely resemble the original piece. However, I'm happy with my choices and am pleased with how they have applied so far. October 10, 2012: This week is killing me. And I'm getting sick. I discovered that there's a couple of small areas where my application of base-paint didn't adhere to the page, it's similar to the issues I was having with pergamenata before I learned how to better prepare the surface. In this instance I have to just peel those small sections off, scratch up the parchment surface and then reapply the paint. Hopefully that solves the problem for this piece, in future I'll have to roughen the surface a little more so I have better tooth. Managed to get the bulk of the whitework done. I used ceruse (white lead) pigment for the very first time, and I'm now wondering why I've avoided it for so long. Once I got the consistency right and was comfortable, it applied effortlessly and makes very opaque lines which is wonderful. October 11, 2012: After an incredibly long week I think I'm done. At least I'm telling myself that it's time to step away. 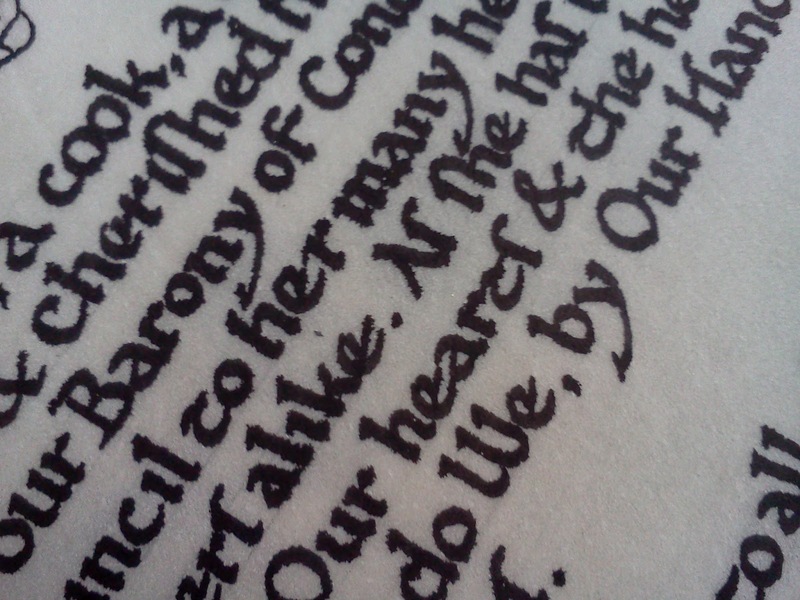 I finished the whitework this evening and I just want to repeat how much I love lead-white. I'm experiencing paint flaking issues. I think I've caught most of them, scraped and reapplied. I hope eLeri likes it. Thank you to my co-conspirators: Elizabeth Greenleaf, Heather Rose de Gordoun, Master Emerson True and Jean Paul Ducasse. Master Emerson showing the piece to eLeri at Coronation. Photo used with permission from Deirdre O'Rourke. October 19, 2012: Sadly, eLeri has moved her journey forward, lighting the way for the rest of us. Her welcoming embrace and radiant smile will always be remembered. Calligraphy on the original piece by Lady Elisabeth Greenleaf. Calligraphy on the re-worked piece by Isabel Chamberlaine. Scribal presentation case made by Heather Rose de Gordoun. This piece is inspired by a decorated initial "V" (f. 205) in a 12th century miscellany (Harley 105) held by the British Library. The calligraphy attempts to emulate a proto-Gothic hand with use of Uncial capitals. Ground: Goat parchment prepared and supplied by Baron Jean Paul Ducasse. Materials: Pumice, gum sandarac, Mitchell's #6 and #4 nibs, iron-gall ink. 23k gold leaf on a garlic/glair mordant. Pigments - cinnibar, malachite, azurite, ceruse (lead white). Words by Master Emerson True. Do come now and hear the words of Kenric, King by right of arms and Avelina, Queen of all that is of virtue and grace. Before you is Our beloved eLeri Nefyn. A Lady, a Baroness, a Peer of our Realm but more importantly, a friend. 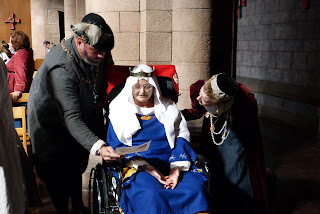 One who has for these last twenty and nine years, touched the hearts of many as a Kingdom officer, a Pennsic Deputy Mayor, a Baronial officer, an autocrat, a cook, a confidant, and, most especially, as a true and cherished friend. She has stood as the heart of our Barony of Concordia of the Snows giving wise council to her many heirs, officers, friends and new comers alike. As she has for so long placed her hand upon Our hearts and the hearts of those of our Realm, so now do We, by Our hand, place Our heart upon her arms. bestow upon eLeri Nefyn an Augmentation of Arms. In witness whereof We have set Our Hand this thirteenth day of October, Anno Societatis XLVII at the Coronation of our Successors, Edward and Thyra, in Our Barony of Concordia of the Snows.